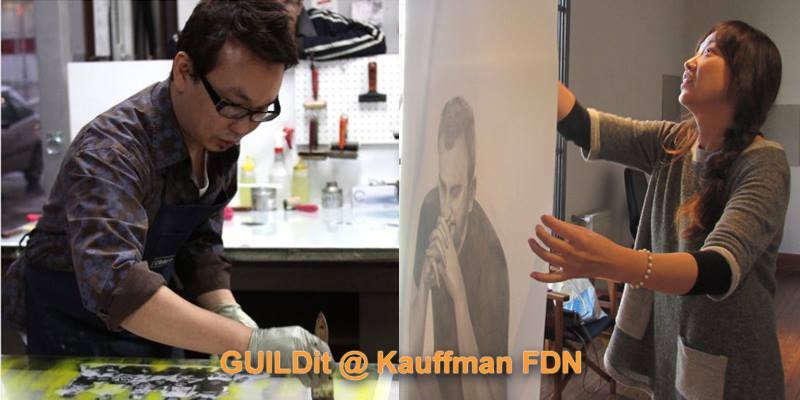 Join GUILDit in celebrating Asian American Heritage Month with these dynamic cross-cultural artists at the Kauffman Foundation in Kansas City! Hyeyoung Shin is the Assistant Professor of Print Media at UMKC Art Department. Her art, at times combines drawing/prints, book art, installations, and performance. Also known as the Spring Festival, this year, Chinese New Year - The Year of the Monkey - begins on February 8th and lasts until Jan 27th, 2017. The festivities usually start the day before the New Year and continue until the Lantern Festival, the 15th day of the new year. This is a time to wish for peace and happiness. Gong Hey Fat Choy means "wishing you to be prosperous in the coming year." Chinese New Year officially falls on the second new moon after the winter solstice. From late January to mid-February, Korea, Vietnam, Japan and other countries celebrate Lunar New Year. Lion Dance performance celebrating Chinese New Year 2016 at The Nelson-Atkins Museum of Art. This year, 2015, marks fifty years since the first US combat ground forces landed in Vietnam and forty years since the fall of Saigon. Thao, a young a 24-year-old Vietnamese woman, is among the Vietnam War's uncounted casualties. Despite her disabilities, a victim of Agent Orange, Thao had set up a makeshift library for children in her village. And then she is introduced to a woman from New York and both lives are changed forever. THAO'S LIBRARY, an Award-Winning documentary opens October 16th in AMC Independent Theatres Nationwide including Kansas City's AMC's Town Center 20! Click here to watch the trailer and for more info about the film. 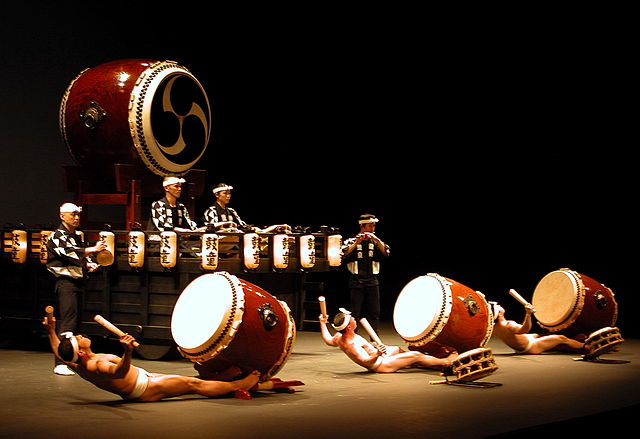 Kodo, the Legendary Japanese Taiko Drumming Ensamble from Sado Island, Japan, will be performing an all new show exploring the limitless possibilities of the traditional Japanese drum. Kodo strives to both preserve and re-interpret traditional Japanese performing arts. "In Japanese the word "Kodo" conveys two meanings: Firstly, 'heartbeat' the primal source of all rhythm. The sound of the great taiko is said to resemble a mother's heartbeat as felt in the womb, and it is no myth that babies are often lulled asleep by its thunderous vibrations. Secondly, read in a different way, the word can mean "children of the drum," a reflection of Kodo's desire to play the drums simply, with the heart of a child." at the Lied Center of Kansas. Enjoy this video "Kodo - Live at the Acropolis"
Are you familiar with this Ensemble? Have you seen them perform? I would love to hear from you! Visit Kodo's Webpage to learn more! "This TRAILER is for the 69 minute feature documentary film: "Moving From Emptiness: The Life and Art of a Zen Dude" featuring Zen calligraphic artist Alok Hsu Kwang-han. Playful. Profound. Meditative and deeply healing, this film is a transformational experience." Congratulations to the Kansas City Royals for making it to the World Series! "The Kansas City Royals' Huge Appeal!" Newspapers from Seattle to Washington, D.C. have dubbed KC “America's Team.” Even overseas, The Independent (UK) noted that America is "falling in love with the Royals." Part of that appeal is Norichika Aoki, the Japanese professional baseball outfielder for the *pennant-winning* Kansas City Royals. Born in Japan, he played for the Tokyo Yakult Swallows of Nippon Professional Baseball before coming to the U.S. to play for the Milwaukee Brewers. Aoki is one of only four players to amass 200 or more hits in a single season in Japanese professional baseball. On December 5, 2013, the Milwaukee Brewers traded Aoki to the Kansas City Royals for Will Smith. And we're happy he is here! "Nori"Aoki, No. 23 right fielder, helped take the Royals to the World Series! 10/2/14: Nori Aoki makes two fantastic run saving plays in the sixth and seventh innings of Thursday nights game against the Los Angeles Angels, one on a backup catch to Lorenzo Cain and another on a great recovery in the outfield. The next inning, with two outs and a runner on third, Aoki tracked a fly to make the diving catch. Watch as Aoki teases the fans after their winning game and tosses his jersey into crowd. Are you an Aoki fan? Click here to read more about Aoki. Laurence Sickman, the former curator and director who started the world-renowned collection of Chinese art at the Nelson-Atkins Gallery, acquired this collection of popular prints that is currently on display in Gallery 222. While living and studying in China from 1930 to 1935, he decorated his own home with the colorful prints. This installation re-creates the decoration of a traditional Chinese home. 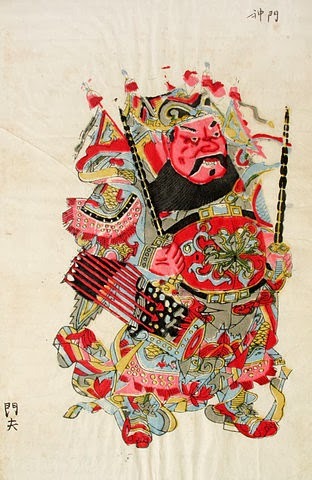 The description of this exhibit says that during festival and seasonal occasions in China, family members select brightly colored prints to display on their doors, windows, walls and furniture. It states that these prints, called New Year Pictures (nianhua), heighten the cheerful holiday feeling. A New Year Picture is a form of Chinese colored woodblock print, for decoration during the Chinese New Year Holiday, then later used to depict current events. Image: New Year picture/ Unknown, before 1900 public domain because its copyright has expired. I am interested in Asian cultures in Kansas City and the surrounding area including St.Louis and Springfield. I like to discover and share cool places and things to do along with information about upcoming events and activities. And more! If you know about something that should be included here, please let me know. And please share this site with your friends and on your favorite Social Media sites! I hope you will participate. Thanks for visiting! Follow Tea Lady's board Reiki on Pinterest. Follow Tea Lady's board Kansas City on Pinterest. 62 different countries have visited this site. Copyright 2001 - 2017 Asia-KC. Simple theme. Theme images by Jason Morrow. Powered by Blogger.